Skin cancer has emerged as a serious health problem in Canada. Last year alone, it is estimated that 7,200 Canadians were diagnosed with melanoma, the deadliest form of skin cancer. Moreover, the Canadian Cancer Society says the incidence of melanoma continues to rise, from 12.6 per 100,000 in 1988 to 21.3 per 100,000 in 2017. Yet, despite these numbers, too many Canadians are failing to properly protect themselves from the harmful rays of the sun, the primary cause of skin cancer. Health Links - Info Santé, for example, receives about 150 calls a year from folks seeking information about how to treat sunburn, which is a major risk factor for skin cancer. With that in mind, I have pulled together a brief primer on the damage that sunburn can cause and what you can do to guard against it. Don't take sunburn lightly: Many people think you can only get sunburn if you spend too much time out in direct sunlight. But you can actually get sunburn even on cloudy days. More than 70 per cent of the sun's ultraviolet (UV) rays get through the clouds, and about 30 per cent can penetrate loosely woven fabrics such as a T-shirt. It's also worth remembering that symptoms of sunburn can emerge as long as two to four hours after damage has been done. Beware of long-term damage: Everyone knows that sunburn is no fun. Symptoms may include redness, a feeling of heat, mild to severe pain and blisters. But it's the long-term damage that can really pose a problem. Repeated sun exposure and suntans cause premature aging of the skin (wrinkling, sagging, and brown sunspots). And keep in mind that severe sunburn is like a second degree burn. Each one doubles your risk of developing melanoma. Staying out of the sun when rays are most intense, usually between 10 a.m. and 4 p.m. Using a good amount of waterproof, broad-spectrum sunscreen with an SPF (sun protection factor) of 30 or higher, which will protect against both UVA and UVB rays. It's best to put the sunscreen on your skin 30 to 60 minutes before you go out into the sun, and reapply every few hours while you are in the sun. If you are playing in water or sweating a lot, put more sunscreen on every hour or two. 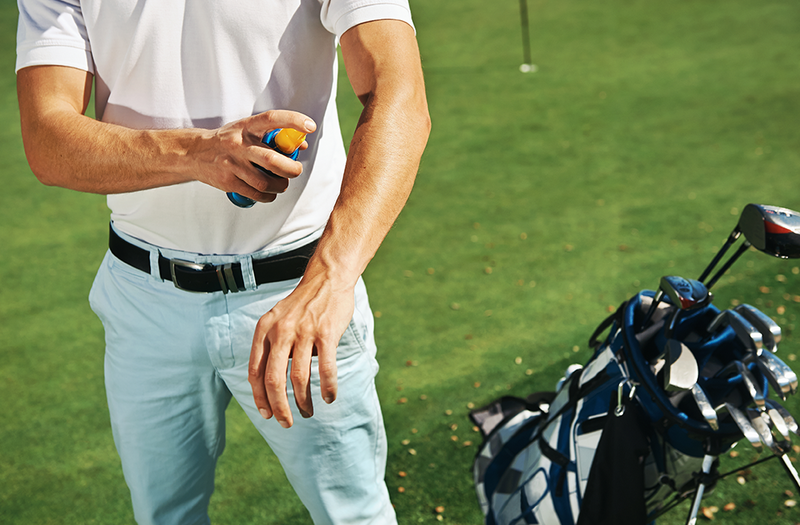 If you need to wear insect repellant put the sunscreen on first. Not using sunlamps or tanning booths. They produce UV rays that can cause sunburn, aging of the skin, and skin cancer. A tanning booth "pre-tan" does not protect against sunburn. If you want to look tanned, much safer choices are self-tanning sprays, creams, and gels. 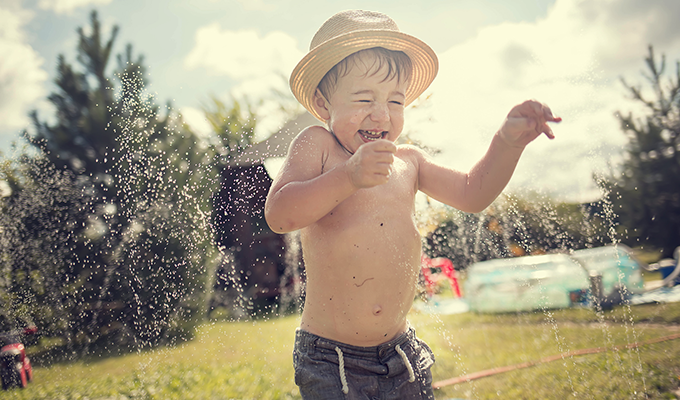 Making sure your child wears a hat and uses sunscreen if they are going to be outdoors for more than 30 minutes. Babies under six months of age should be kept out of direct sunlight. The skin of infants is thinner than the skin of older children and more sensitive to the sun. Drink extra water to replace the fluid lost into the swelling of sunburned skin and to prevent dehydration and dizziness. Avoid alcohol. Soak in a cool bath with oatmeal bath products to help decrease itching and the burned feeling. Put cool, moist cloths on the sunburned skin several times a day. Take an anti-inflammatory medicine, such as ibuprofen, if this is safe for you. Nonprescription 0.5 per cent hydrocortisone cream applied three times a day may reduce swelling and pain, but only if the cream is used soon after the sunburn. Do not use petroleum jelly or other ointments because they keep heat and sweat from escaping. Blisters should be left alone, because the skin covering the blister helps protect you from an infection. If larger blisters break open, apply some antibiotic ointment twice daily, and cover with a bandage. If your blisters seem infected, contact your health-care provider. If you or your child seems quite ill, see a health-care provider immediately. Diana Doyle-Zebrun is Clinical and Quality Initiatives Coordinator at Health Links - Info Santé, a telephone health information service with the Provincial Health Contact Centre at Misericordia Health Centre. If you have health questions, call 204-788-8200 or toll-free 1-888-315-9257. This column was originally published in the Winnipeg Free Press on Friday, June 1, 2018. Confused about which sunscreen you should use? Check out this story and video.